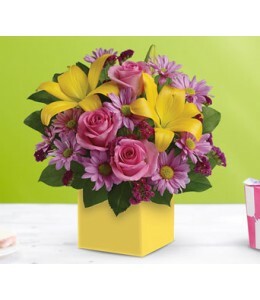 A joyous surprise for any occasion, this bright, beautiful box arrangement of pink roses, golden lilies and lavender daisies is sure to please.Flowers are subject to seasonal availability. In the even.. 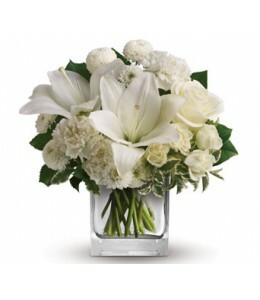 Wish upon a star, but seal the deal with the pure white perfection of this luxurious cube arrangement. 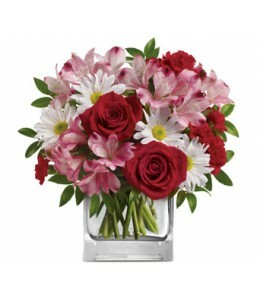 These fresh and fragrant flowers will make you the star of her heart!Flowers are subject to seaso.. 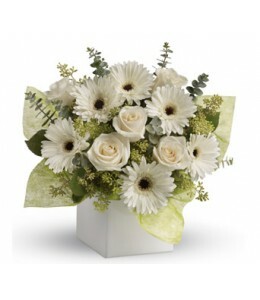 Send serenity with this artful arrangement of pure white roses and gerberas.Flowers are subject to seasonal availability. 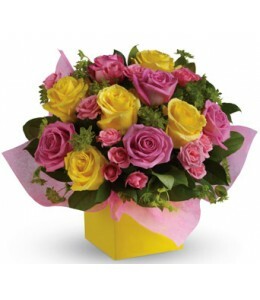 In the event that any of the flowers are unavailable, the florist will substit.. Send Zen. 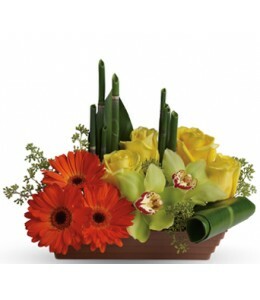 Capture the peaceful energy of the rising sun with this artful, Asian-inspired arrangement of orchids, gerberas, roses and tropical greens.Flowers are subject to seasonal availability. In th..